Finding your home infested with insects can be an extremely unpleasant and disruptive experience. Two of the most common types of unwanted guests are flying ants and termites, also known as swarmers. Not only are these swarmers unpleasant, but they can also cause a considerable amount of damage to your property and even to your health. Upon first inspection, flying ants and termites look and behave very similarly, so it can be hard to distinguish between the two. However, as the treatment of these pests is different, it is important to be able to understand which insect is in your home. Observing their appearance and behavior can easily help you to distinguish what you are dealing with. From a distance, both are small, black insects with wings. But one way to distinguish between the two swarmers is to closely examine the bodies. Though both have three body regions (the head, thorax, and abdomen), they look different from one another. A termite’s body will look uniform and it will be difficult to see each different region. The abdomen will be straight, making the body look long and thin. In contrast, flying ants have more distinctive body regions, with the waist looking thinner than the rest of the body. This pinched waist divides the body into three visible sections. An easy way to tell is by the flying ant's likeness to the garden ant. Another way of telling them apart is by examining the antennae. A termite’s antennae will be straight and beaded, giving the appearance of small dots. The flying ant will have bent antennae. Both insects have four wings, but they are different shapes and sizes, making the difference more easy to identify. Termite wings are all the same length and are around twice the size of its body. These wings are rounded at the ends and are translucent white in color. As they are fragile, it is common for termites to lose these wings, so you may find them discarded in areas where the swarm has taken residence. The wings of a flying ant are the same size as its body and front wings are longer than the back. Unlike termites, the wings are pointed at the tip and are usually light brown in color. A female ant swarmer will lose its wings once it mates, so if you see lots of insects crawling around, it is more than likely you have ants. Both swarmers are most commonly seen in the warm weather and after rain, as they thrive in warm, humid conditions. Flying ants are more likely to be seen outside than termites; if you find an insect flying in the garden or near windows and doors, this will likely be an ant. As they often feed on crumbs and leftover food, you may also encounter a few in the kitchen. Although they are a nuisance, they are unlikely to cause any damage to the home, however, if they are threatened, certain species may sting. Termites are harder to spot and are seldom seen, as they create colonies in small spaces which are harder to locate. They can dwell in wall cavities, attics and even in the foundations of your house. If you find termites flying around, this will only be indoors as swarms do not usually venture outside. An easy way to check for termites is to look for damage to walls, floors, and any other wooden surfaces. If you have a swarm in your home, there will likely be lots of small holes in the wood. Since termites eat wood, they can destroy the home and cause a great deal of costly damage. 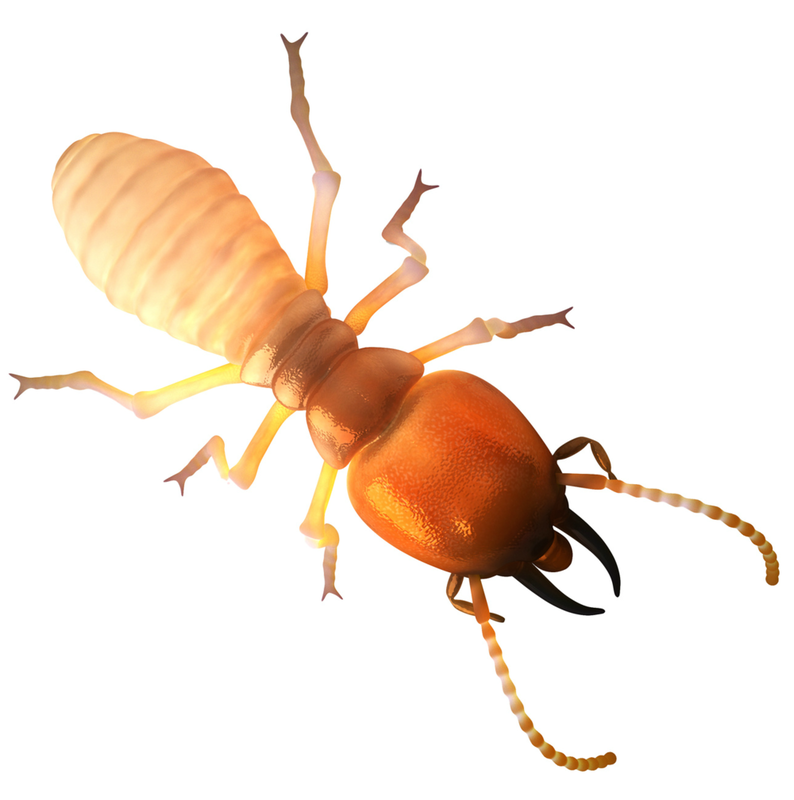 If you spot termites, you should contact pest control services immediately. Both insects will leave their swarm in large numbers and seek a new one when they are ready to reproduce. Swarming is known as the mating phase of winged ants and termites, and once they find this new home, they start their new colony and stay until their death. Though both will look to mate in the warm weather, you can usually identify a pest by the time of year it occurs. Termites will usually swarm in the early months of spring, whilst ants occur in the summer. Once a new colony has been created, both ants and termites will reproduce quickly. Termites will twist off their wings once they have mated, as they do not need them anymore. Similarly, male ants will die after mating, but females will continue to live without their wings as they will fall off. If you find discarded wings around the home, be sure to check their shape and location: termite wings are long, round and are likely to be found in piles on the floor or work surface. On the other hand, if you are finding short wings which are unequal in size, this will be from a flying ant. These wings are commonly found on windowsills. If you are finding a number of swarmers in your home, this will mean you probably have a colony already. Colony sizes can get out of control quickly, so it is important to take action immediately. Once you have identified which swarmer you are dealing with, you should enlist help from professional termite pest control services as this is the most effective way of ensuring that your home remains insect free. Getting rid of flying ants and termites will eradicate the existing swarm and significantly reduce the chance of future ones. This can be extremely difficult. Contact Big Time Pest Control today for quality pest control services.